LP-clamping unit with resonance absorbing locking unit and stainless steel grip. A wonderful three piece collettype Record Clamp. Resonance control is effectively handled with this clamp through the clever use of three materials. 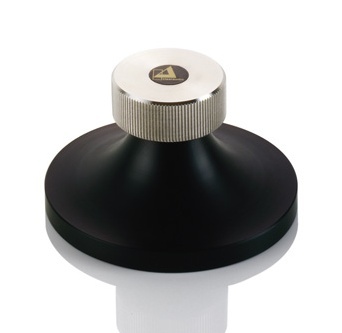 First the Delrin puck makes impedancematching mechanical contact with the record label. 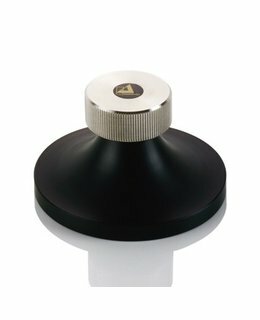 Secondly the brass collet puts an ultratight grip on virtually any turntable spindle and finally the stainless steel tension knob allows for proper tensioning of the clamp while adding resonate controlling mass.